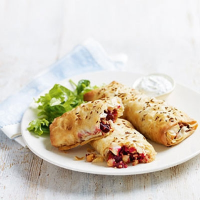 These crisp, savoury parcels are easy to make and packed full of flavours. They make a great starter or midweek lunch, or try mini versions as a canapé. Preheat the oven to 200ºC, gas mark 6. Lay 2 of the Cypressa Fillo sheets out on a flat surface. Stir the spice mix into the melted butter. Brush a little of the flavoured butter sparingly over 1 sheet and place the other sheet on top. Cut the beetroot into small chunks and place in a bowl. Add the couscous salad, feta and seasoning and mix to combine. Spoon a quarter of this mixture along 1 of the, short ends of the pastry. Tuck the long edges of the pastry in to enclose the ends of the beetroot mixture, then start rolling from the short end of the pastry to make a rectangular parcel (like a plump spring roll). Brush the seam with butter to seal. Place onto a non-stick baking tray. Brush the top of the pastry with a little more butter and scatter some cumin seeds over the top. Repeat with the remaining ingredients to make a further 3 parcels. Place in the oven and bake for 10-15 minutes or until golden brown and crisp. Serve with the dressed salad leaves.